1. Place potatoes in a large pot and fill with water. Place over medium-high heat and bring to a boil. 2. Boil potatoes until fork tender, about 25 minutes. 3. While potatoes boil, place cream, butter and garlic in a small saucepan and simmer. Once mixture comes to a simmer, remove from heat. 4. Drain potatoes in a colander and return back to the pot. 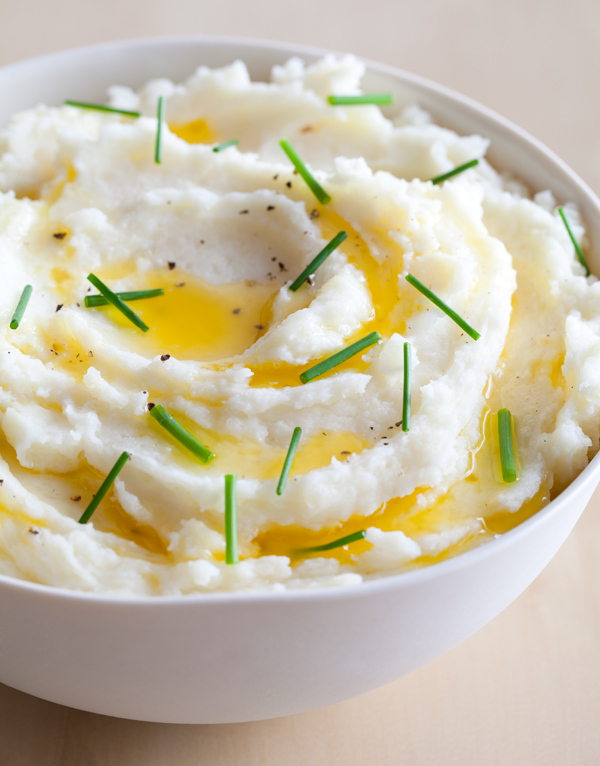 Lightly mash the potatoes and season with salt and pepper. 5. Pour cream mixture over the potatoes, a little at a time and mash the potatoes until all the cream mixture has been used and potatoes are smooth. 6. Stir in pureed cottage cheese and sliced chives and season with salt and pepper. 7. Top with remaining chives and melted butter, if desired. Serve warm.